Today I took my last walk through Prospect Park for 2004. I guess in the back of my mind I was hoping to locate one more bird species for our year list. On this date last year I wore a goose-down coat and my breath crystalized on my beard as I walked through the park. Today the temperature was in the fifties, I wore a light jacket and the only thing on my beard was perspiration. I checked on Big Mama and Split-tail's nest on Payne Hill. The two hawks weren't in the vicinity but it appears that they have added a lot of new sticks, particularly on the east side of the nest. I walked down into the Midwood where there seemed to be a flock of birds at the north-east corner of the woods. A flock of goldfinches, chickadees and titmice were feeding in a Sweetgum tree. 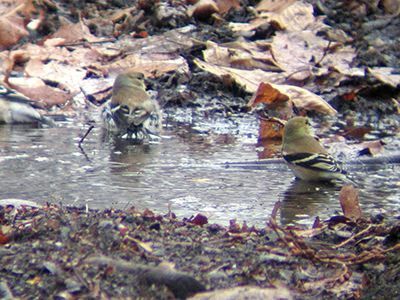 There was a small puddle on the muddy bridle path below the tree that they were using for bathing and drinking. I watched them for a while until they were scared off by a horse. At the south end of the woods I heard a pair of squirrels squealing at some unseen danger. I searched the trees for a few minutes and spotted the object of their concern. 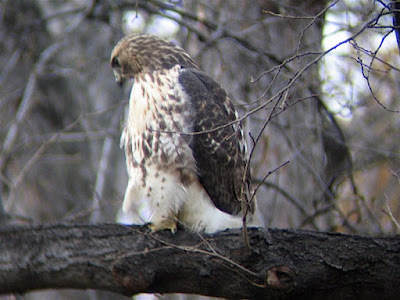 Like a guard in a watchtower, a Red-tailed Hawk surveyed the woods from the top of a towering tuliptree. He eventually flew off in the direction of the Nature Center. Despite the warm temperature the lake is partially frozen. There were several thousand Ring-billed, Herring and Great Black-backed Gulls either perched on the ice or bathing in the frigid water. I walked the edges of the Peninsula looking for one of the Ash-throated Flycatchers but they seem to have moved on. At lamppost J249, at the base of Lookout Hill, there was a small flock of White-throated Sparrows feeding on the red berries of the Common Nightshade that is intertwined with the fencing. I guess the birds are immune to its toxins. 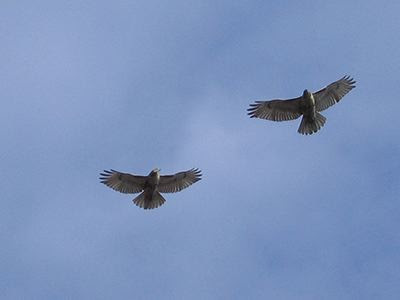 As I watched the sparrows I heard a pair of Red-tailed Hawks calling above me. 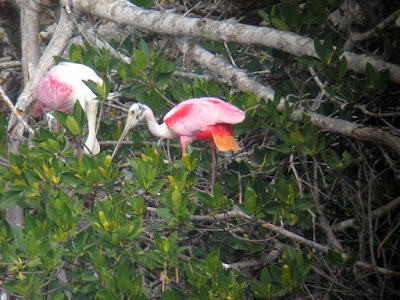 Big Mama and Split-tail were involved in a pair-bonding ritual close to treetop level. They'd circle each other closely, dive down close to the ground, then quickly ascend into the air above Lookout Hill. Occasionally they would fly towards each other then veer off at the last moment. One of their offspring flew out of the woods on the hill and attempted to join in with their playing. Split-tail strongly objected and chased him back into the trees on the hillside. He didn't seem to get the message and continued to fly between his parents. There were times when it was difficult for me to determine which behavior was aggression and which was bonding. 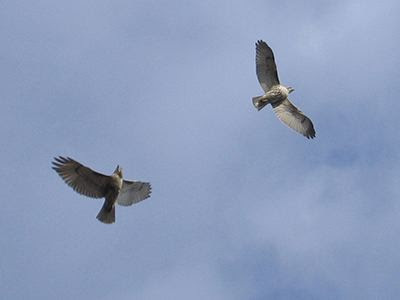 The two adults came close to each other but never touched, whereas, the young hawk was slammed into numerous times. And so the cycle begins again. 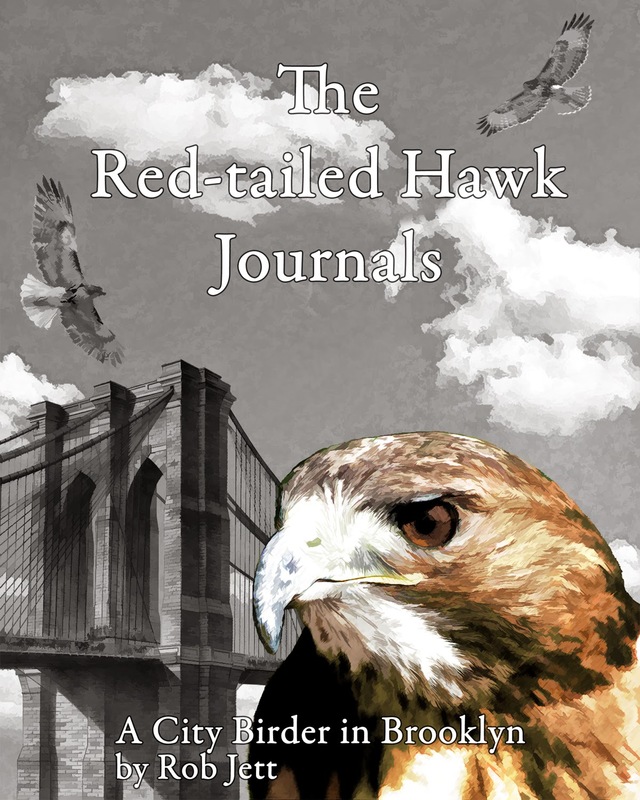 The adult Red-tailed Hawks will eventually get their offspring to move on so that breeding can commence. As I was leaving the park I turned around and took one last look then placed the covers on my binoculars. Tomorrow I will post a year wrap-up with some highlights and observations. 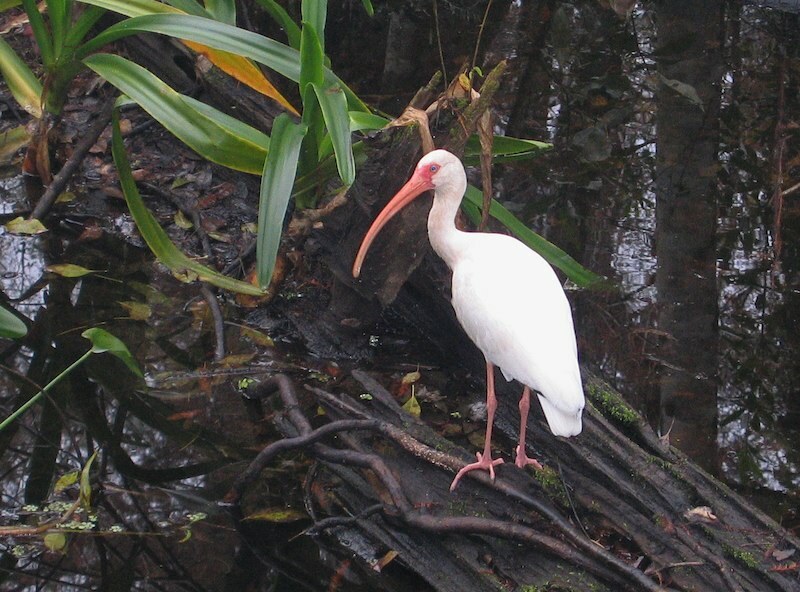 On a very wet Christmas morning we had a backyard visit from "Rudolph the long nosed Wood Stork". I asked where his antlers were and he just croaked at me. There was a lot more rain today but that didn't stop us from trekking over to Corkscrew. The low light and moisture limited my picture taking but I do have a few nice shots to share. We ran into a birder from Long Island who knew me (I assume from my postings) and we talked about who we knew from NYC as we birded together. 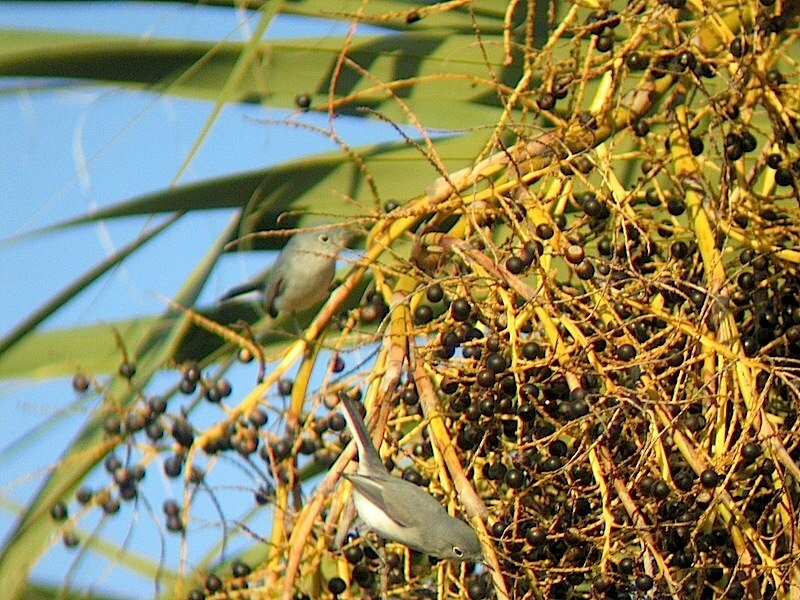 We spotted 8 species of warbler among a mixed flock of, primarily, Blue-gray Gnatcatchers. 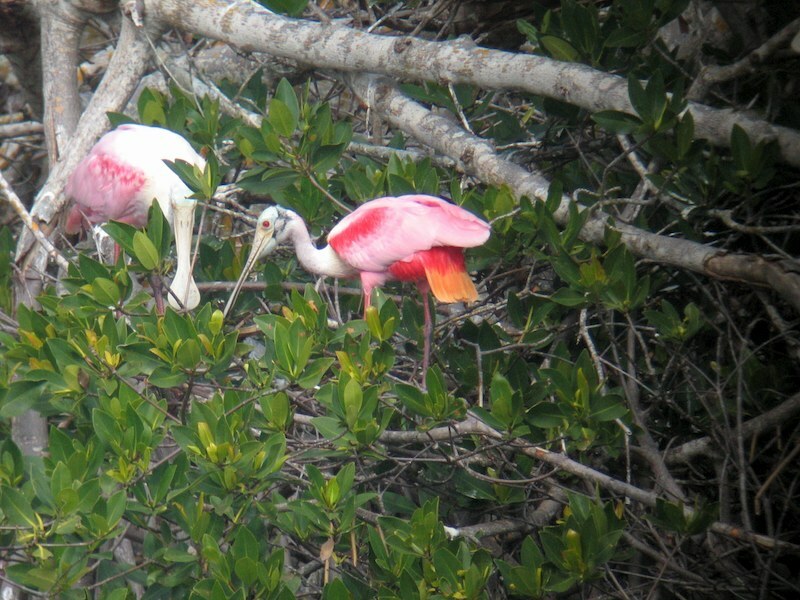 What holiday would be complete without an illuminated, motorized pink flamingo (Phoenicopterus mechanicalae)? 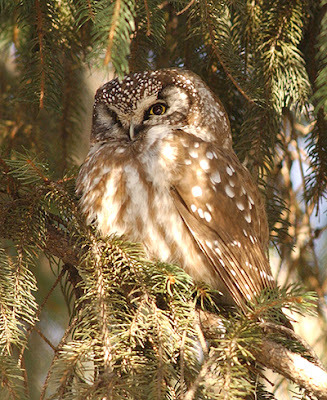 A rare Boreal Owl was located in Central Park yesterday. Some people may think that I'm overreacting, but I was extremely dismayed when two discussion group moderators posted directions to the roost. It has always been considered bad birding ethics to give directions to an owl roost but I suppose their excitement won out over good sense and a little planning. 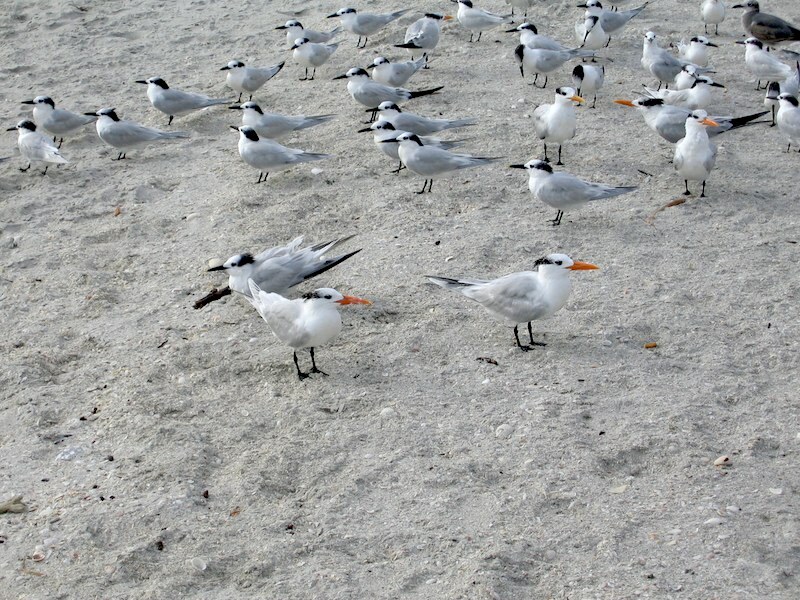 With a bit of organization I think it could have been a great opportunity to teach birding ethics, as well as, the behavior and habits of a rare bird. 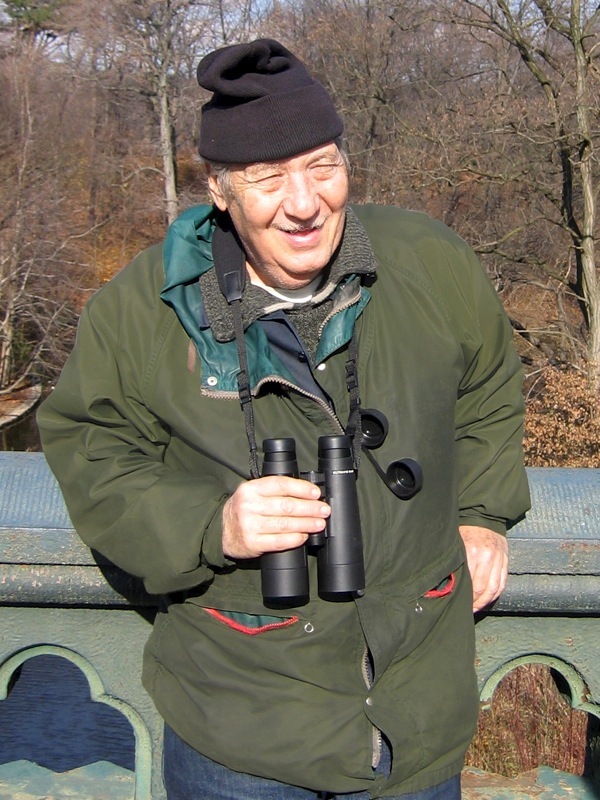 click for The ABA's "Principles of Birding Ethics"
click to see Cal Vornberger's photos"
Thanks for the message. I suspect the boreal in central park will be in for some serious scrutiny. That can be good and that can be bad. Good, because it increases the public's awareness about owl biology and population patterns and habitat and our shrinking environment. 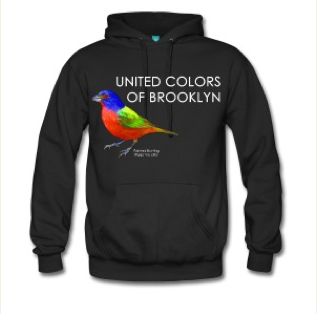 Bad, because one overzealous birder can leave a bad taste in everyone's mouth. Given my biologic background etc., I am always discrete about owl sightings and/or owl locations. In nearly 2 decades with boreals, I know enough about their behaviors to suggest the following: if the bird is in a roosting posture (i.e. daylight, sleeping, oblivious to the big apple) observers can do their thing without too much impact on the owl. People should be encouraged to observe away from the bird...which will give all an opportunity to field test and brag about their binocs and scopes. If however, the owl is hunting diurnally, then any undue disturbance can have severe impacts on the survivability of the owl. 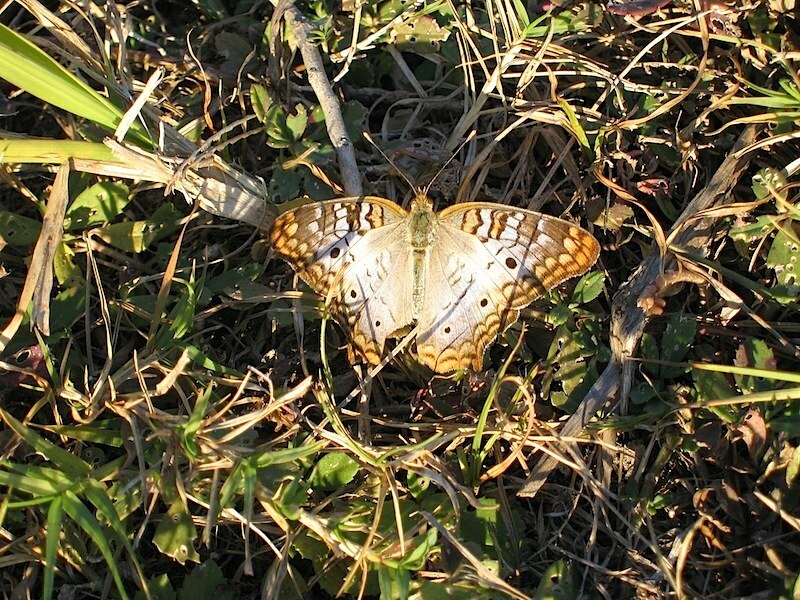 Diurnal hunting by a nocturnal species is a sign of metabolic distress. 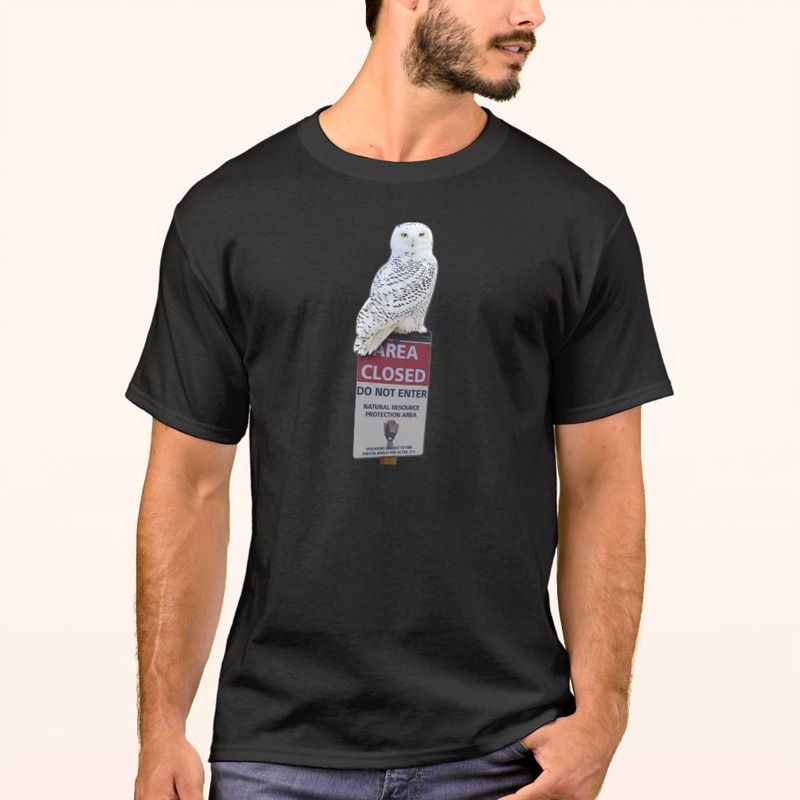 Leave the owl alone, or throw it a mouse and then leave it alone (good luck on that one in nyc). And, yes, you are right in interpreting the birder's explanation about the owl. 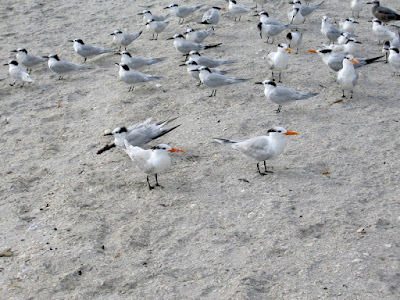 My experience is that an opportunity at a rare species has many birders rationalizing or justifying their own behaviors, including trespassing, poor discipline, and poor ethics. At that point, we get into human behavior which ultimately, trumps owl behavior and birding decorum. 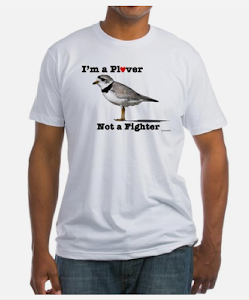 Not all birders, mind you, but one is enough. Finally, boreals typically do not roost in the same tree (at least in the boreal forest) with any regularity. 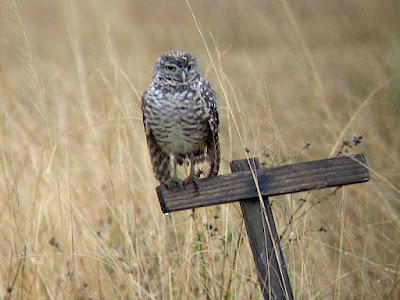 Therefore, finding the owl likely won't be automatic and may give the bird and concerned birders, some relief. Please keep me posted on how things develop. click to go to the Owl Man's website"
Today was the 105th annual Christmas Bird Count in Brooklyn. I like to participate in the less frequented sections of Brooklyn as it typically does not get much coverage. Plus, I usually spend most of my time in Prospect Park and need the change of scenery. Floyd Bennett Field, Dead Horse Bay and Four Sparrow Marsh is a huge area to cover and I enjoy helping out Ron Bourque and his wife, Jean. The area our group surveyed also encompasses a range of habitats from grasslands and pine forest to marshes and bays. Our team of six people met at first light near the entrance to Floyd Bennett. We assembled our scopes and Ron gave us an overview of his plan of attack. Unlike previous years, we started out at the pine forest surrounding the camp grounds. I made it my mission to locate the owls. Gil Shrank and I zig-zagged our way through the forest looking for white-wash and owl pellets; indications of an owl's roost. The soft, deep carpet of brown pine needles were pockmarked with depressions left by foraging squirrels. I was attracted to one large hemlock with a small splattering of white on the lower branches. Below we found eight large pellets on the ground. They seemed large enough to be from a Long-eared Owl or Barn Owl. We did a thorough search of the upper branches but were unable to locate the source. 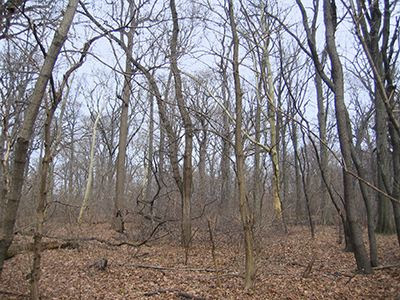 Much of the forest's border is dominated by a dense edge of sumac, blackberry bramble and small conifers. Traversing this section is made even more difficult by tangles of bittersweet. I saw some small, healthy conifers in that area and decided to try and check them out. Pushing my way through the labyrinth of plants I spotted a tree that I was certain held a small owl. The base had a large area of fresh white wash. As I got closer I could see a direct path of drippings down the side of the tree. When I got to the tree I noticed three or four small owl pellets. I assumed it was a saw-whet owl and got very excited. I knew if I followed the trail of white it would lead me to the diminutive sleeping owl. The trail ended about seven feet off the ground. Instead of a saw-whet owl, however, I found a freshly killed White-footed Mouse draped over a branch. Had I just interrupted the owl's breakfast? Maybe he was still in the area and was just saving it for later. I went back to the roost two more times to see if the owl returned but came back disappointed. I read recently that saw-whet owls will cache their prey for later consumption and that, in the winter, will incubate the frozen prey like an egg to thaw it out before eating! I located two more areas with white wash and pellets but still ended the day without an owl on our list. 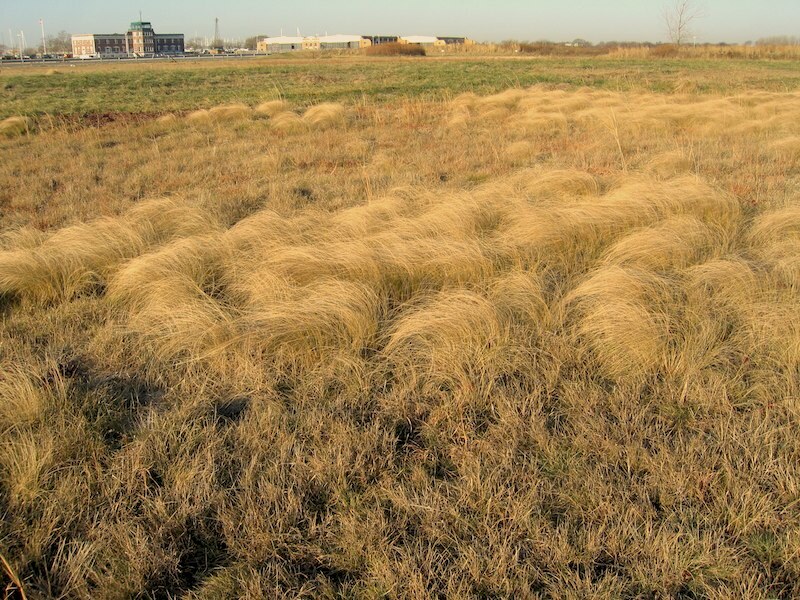 After we left the pines we began the long walk across the grasslands. Forming a line at the edge of each field between the old runways we walked slowly to the opposite side. I was the lucky one to flush up a small flock of Eastern Meadowlarks and yelled for everyone's attention. 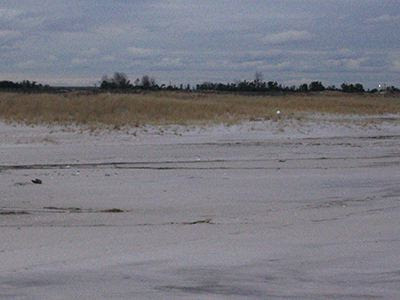 Floyd Bennett Field is one the few places left in New York City where you can still find this increasingly rare bird. There were eight birds in the flock; the most I've counted since I began participating in the count. Along the shoreline we scoped out Red-throated Loon, Common Loon, Horned Grebe, Great Cormorant, Double-crested Cormorant, Gadwall, American Black Duck, Mallard, Greater Scaup, Long-tailed Duck, Bufflehead, Common Goldeneye and many Red-breasted Merganser. A lone Surf Scoter at Dead Horse Bay was unexpected (what's a sea duck doing on a bay). 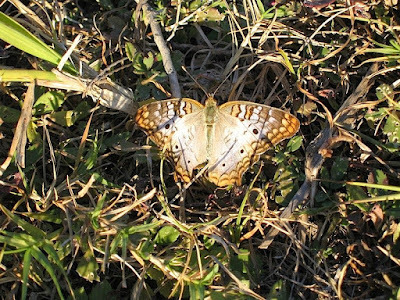 It was a "save" species for Brooklyn (the only one recorded). As the day was winding down we drove the cars over to the police headquarters. There is an annual over-wintering Merlin at Floyd Bennett that is extremely punctual. Everyday at 4:30pm he arrives at his perch in one of the trees bordering the building. Today he was twenty minutes early so I had enough light that I could run back to saw-whet roost. I was hoping that the owl had returned to his tree but they only thing in there was the dangling mouse. Some expected species were curiously absent today but they were made up for by the unusual ones. In all it was a satisfying, if exhausting day where we tallied 56 species of birds and one recently departed White-footed mouse. Greetings! This is the New York City RBA for Friday, December 17th at 12 noon. The highlights of today's tape are AMERICAN WHITE PELICAN, RUFOUS HUMMINGBIRD, ASH-THROATED FLYCATCHER, CAVE SWALLOW, SNOWY OWL, and EURASIAN WIGEON. Last Sunday, a little after 2 p.m., an AMERICAN WHITE PELICAN was seen flying by Baldwin Park in Baldwin, heading across the bay towards the Jones Beach-Point Lookout area. It has not been relocated. In Central Park the Selasphorous HUMMINGBIRD, believed to be a female RUFOUS, was last seen at Strawberry Fields on Monday, but the YELLOW-BREASTED CHAT and WOOD THRUSH were still there Thursday. A male WILSON'S WARBLER was also still at the Conservatory Garden Thursday, and an ORANGE-CROWNED WARBLER was reported from the Ramble Sunday. 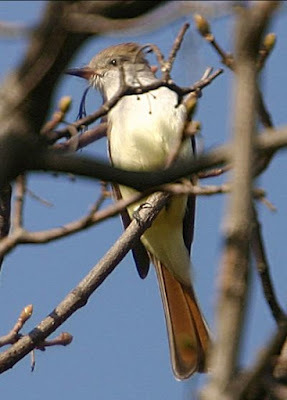 At least one of the two ASH-THROATED FLYCATCHERS was still being seen in Prospect Park through yesterday. Both birds, seen together a couple of times in the past week, have been frequenting the edges of the open field on the Peninsula on the north side of Prospect Lake, or have been along Wellhouse Drive, including near the brick building or moving up the side of Lookout Hill. 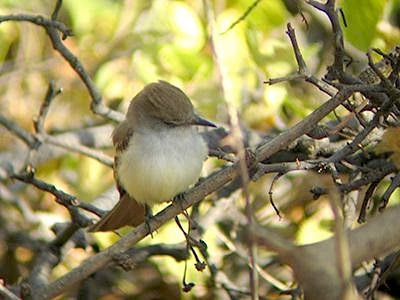 Also in Prospect, the NASHVILLE and WILSON'S WARBLERS were present at least to Sunday, and the park has been hosting three PIED-BILLED GREBES, two WOOD DUCKS, up to 250 NORTHERN SHOVELERS, a male RING-NECKED DUCK, and such passerines as WINTER WREN, RUBY-CROWNED KINGLET, HERMIT THRUSH and FOX SPARROW. Thursday morning a very freshly deceased CAVE SWALLOW was found under the I-95 Thruway bridge next to the Rye train station in Westchester County, providing a first county record. The bird apparently was roosting under the bridge for the night and froze to death. 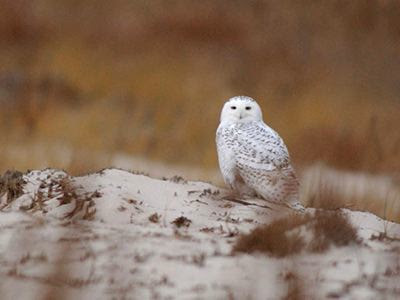 A SNOWY OWL was seen again last Sunday along the beach at Jones Beach West End. 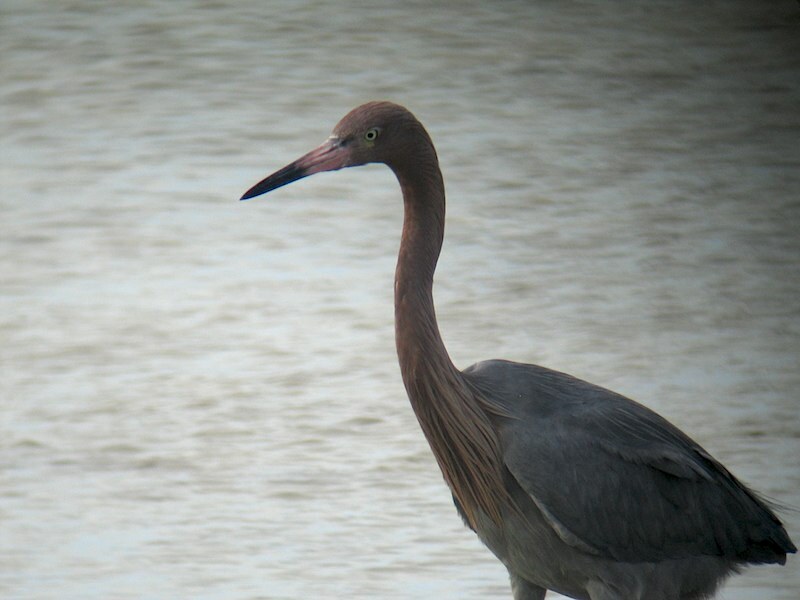 This bird ranges from the jetty to east of the Roosevelt Nature Center. If you are fortunate enough to see this bird, please do not disturb it. 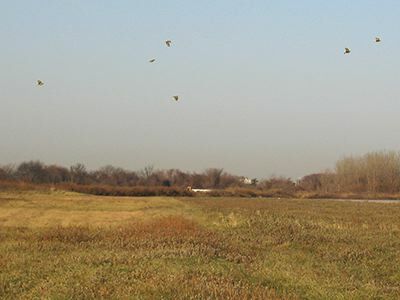 A drake EURASIAN WIGEON was still present over the weekend at the top of Gerritson Creek in Marine Park, Brooklyn, and two were reported from Jamaica Bay Refuge's West Pond Sunday, with one there Thursday. An adult BALD EAGLE was spotted Tuesday morning on Staten Island at the William T. Davis Refuge, flying towards the landfill. Out east, a small CANADA GOOSE, thought to be a CACKLING, the newly split grouping of the small forms, was at the Grumman Pond along Grumman Boulevard in Calverton late last week. A EURASIAN WIGEON was on Deep Hole Creek on the south side of New Suffolk Avenue beyond Maratooka Lake in Mattituck on Tuesday, and an apparent hybrid WIGEON was there Sunday. At Shinnecock Sunday there were four COMMON EIDERS and 12 RAZORBILLS. Two TURKEY VULTURES were over Van Cortlandt Park yesterday. We will be happy to report highlights of our local Christmas Counts, so please phone in your results. For information on a pelagic Christmas Count out of Belmar, NJ on December 31st, call See Life Paulagics at 215-234-6805 or visit their website at www.paulagics.com. "New Yorkers Hear the Call of the Wild"
"Last weekend I was looking at one of the Ash-throateds with Phil [..]. We walked out of the Park together and nearly stepped on an imm RedTail which had just caught a squirrel. I actually hit him with my foot. He moved off a few feet. We walked off a bit. He went back to his prey. I took a few shots, two of which are on the web with the Ash-throated shots. It then took off with prey down the path. Sean told me that I was probably the only person he knew that was crazy enough to join him at the beach in the winter before sunrise. I'm not sure but I think that was a compliment. So at 5:15am I met him in front of my building and we headed off east to Jones Beach. For a photographer, I think that the importance of early morning light is in its low angle, the clearness of the air and the quality of the colors. 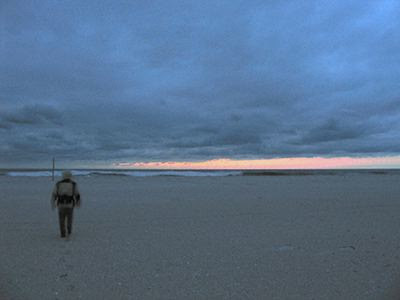 I enjoy dawn at the ocean (or anywhere in nature, for that matter) not just to experience the momentary solitude, but also to absorb the gradual crescendo of sights, sounds and smells as the day unfolds. We got to the beach much faster than expected. A few fishermen were the only other people in the parking lot. As we set up the scope and camera it was clear that we were both underdressed. The strong, gusting wind was much colder than we had expected. The stars were hidden under a thick cloud blanket. Behind us was the pink glowing dome of the city that never sleeps. In front of us were two or three points of white light bobbing on distant swells. As an orange and pink sliver began to open on the horizon we hefted our tripods over our shoulders and started the five minute walk towards the shoreline. Sandpipers must have been roosting in the grass at the edge of the path. As we approached one began to stir and started calling. A second, then a third were roused by our presence and warned the rest of the flock. Suddenly Sean noticed a large, slow flapping ghost to our left. We could barely make out its shape but knew that the large bird was a Snowy Owl. Perhaps it was the owl that woke the sandpipers and not us. I followed it in my binoculars as it flew east then dropped out of sight. As we stood on the beach the blackness of night had begun to retreat and everything appeared in shades of gray. A few gulls skimmed the rough surf close to shore. I scanned the beach and spotted what looked like an owl perched on a mound of sand several hundred yards down the beach. As we walked the edge of the foamy surf flocks of Sanderlings began to arrive at the shore to feed. Four Red-throated loons flew west just inches above the waves. We tried to be discreet by walking below the gentle rise of the sandy berm. The owl spotted us, though, and flew to a low, grassy rise that fringed the dunes. I watched the Snowy Owl in the scope from a safe distance. 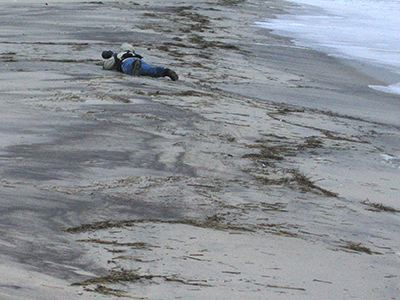 Sean mounted his camera on a wooden "sled" and started a sloth-like, methodical crawl towards the dunes. The clouds weren't clearing fast enough and the early morning hours remained cold, windy and gray. Like a lighthouse on the edge of the dunes the bright, white owl seemed to be guiding birds in for a safe landing on the sand. A flock of twittering Snow Buntings flew overhead. Could they have been some neighbors from the arctic? As Sean slowly made his way towards the owl I watched in the scope as the bird preened his young, spotted plumes. He seemed to be aware of Sean's approach and periodically craned his neck up and down like a jack-in-the-box. He ignored Sean and went back to preening. It seemed like fifteen minutes had passed and Sean hadn't made much progress. Suddenly the owl began bobbing his head up and down again, spread his massive white wings and flew deeper into the dunes. Sean looked a little disappointed but we decided that it would be much healthier for the owl if we left him alone. He is probably disrupted much more often while hunting in urban areas than in his normal northern habitats. I suggest that you get as much mileage as you can from your letters of protest. You should also mention in your letter if you have been (or plan to be) visiting NYC and how this might affect your plans. Today was Marty's birthday. He lives in Brooklyn close to Prospect Park but he almost always spends his days birding with friends in Central Park. 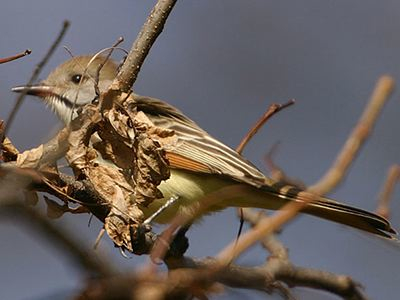 He called me to ask if the Ash-throated Flycatcher was still around so I decided to take a walk today and help him track it down. I thought the flycatcher would make a nice birthday present as he has never seen this rare bird in the park. Near the Nethermead Arches, on Center Drive, a cluster of Sweetgum trees are still full of ripe fruit. A number of goldfinches worked the tops of the trees while a flock of Dark-eyed Juncos picked up the spillage from the sidewalk below. White-throated Sparrows scratched the leaf litter in the woods for the billions of sand grain-sized seeds. I ran into my friend Jerry at about 10am near the Maryland Monument. As we were talking, we spotted Marty and Shale walking down the steps behind the battalion tribute. He said that the flycatcher had already been seen by a number of people earlier in the morning near lamppost J249. It's only a short walk to that area at the start of Wellhouse Drive. We met Pat and Emily there who had just been watching it, as well as, the brilliant yellow Wilson's Warbler that's been hanging around. Unfortunately both birds had just flown off in a northerly direction. After scanning the area for a few minutes we decided to take a slow walk towards the Wellhouse. 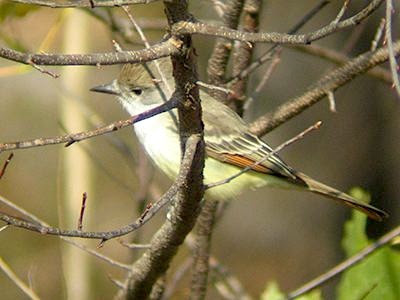 The Ash-throated Flycatcher had been observed frequently feeding in gingko trees. 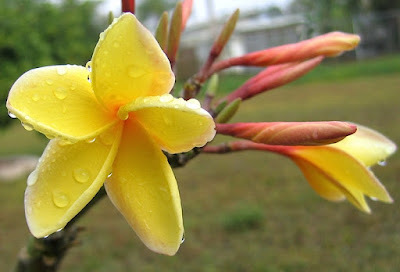 I presume that numerous insects have been attracted to the pungent, rotting yellow fruits. Standing around at the base of a gingko tree at this time of year is not the most pleasant olfactory experience, but to observe an interesting bird most birders seem to tolerate it. There are a few gingkos next to the Wellhouse and, once there, we noticed some birds feeding near the ground. With most of the group standing behind me, I walked around the south side of the building. Jerry decided to walk around the north side. As soon as we got to the weedy, unkempt area at the back of the Wellhouse we spotted the flycatcher perched at about roof level. I called the rest of the group over. Seconds later Jerry and I noticed another bird flying over to the flycatcher's perch. A lightbulb seemed to go off in our heads and we yelled in unison, "There's two of them!" The unusual has now become the unbelievable. 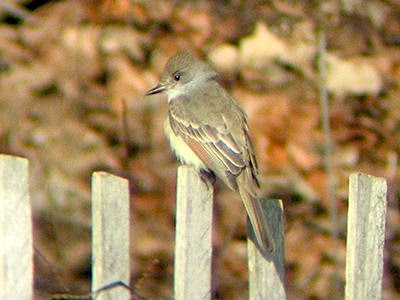 There are two, rare western flycatchers in Prospect Park. 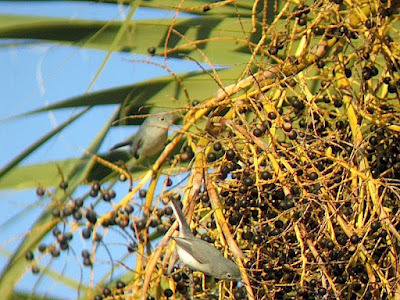 Moments after bird number two perched near bird number one, the first flycatcher made a soft, buzzy "brrrrr" sound and chased it away. 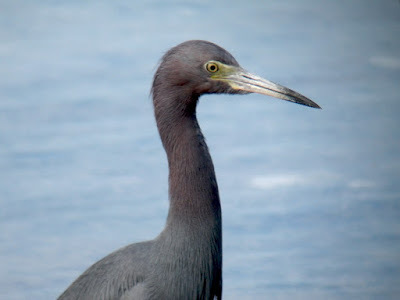 Other birders joined us and we spent the morning tracking them down. I eventually refound them higher up Lookout Hill where some folks took photographs. One bird returned to the low brush on the south side of the Wellhouse while the second was observed flycatching along the edge of the grass near the Maryland Monument. My friend Shane has been missing all the excitement as he has had to work late. 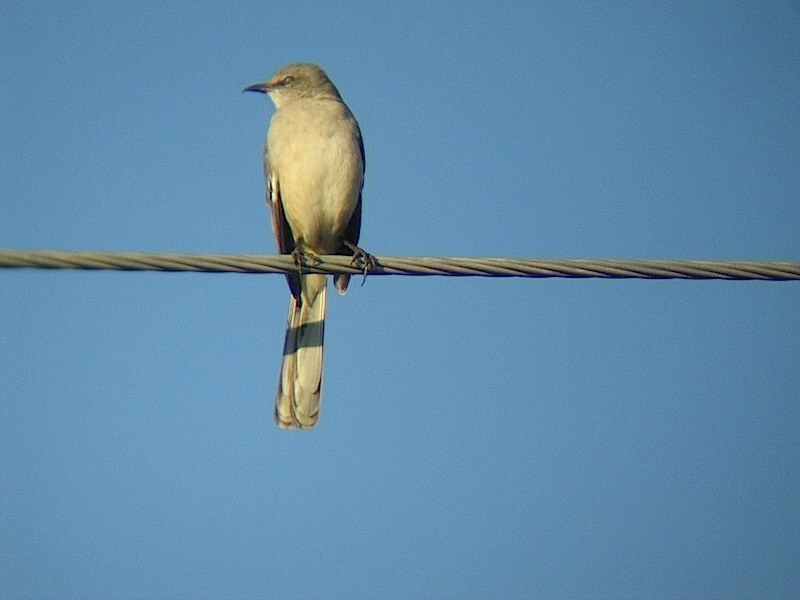 He called me late this afternoon hoping to find the flycatcher before sunset. I hopped on my bicycle, road back into the park and met him near the Wellhouse. We didn't find it right away. At the grass bowl in front of the Maryland Monument we spotted a Red Bat fluttering about feeding on insects so presumably there are still plenty of flying things to eat. 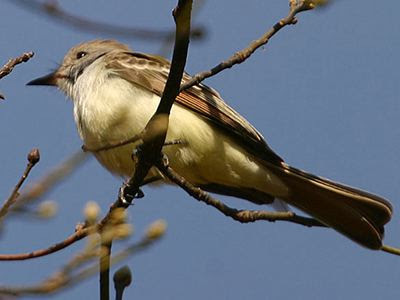 Finally, with less that a half hour of light left we located one of the Ash-throated Flycatchers in a gingko tree across the road from the Wellhouse. This was the first day this season that I've had to layer up against the cold. There was a cool dampness in the air that felt like a storm on the horizon. It never did rain and we even managed a few, brief patches of sunshine. In just a single week it seems like the remaining bits of foliage in the park has fallen. 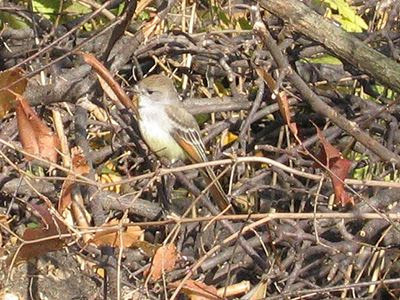 A few days ago the Ash-throated Flycatcher, with its lemony underside, was able to disappear into the golden leaves of the gingko trees. 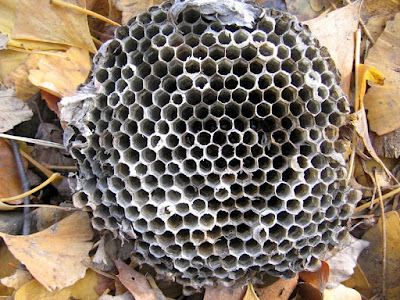 Now all the hidden bird nests and wasp nests are easy to locate. Today was Sean's fourth attempt to find the Ash-throated Flycatcher. We ran into Bob (the man who originally found the bird) and Juliette who had also not seen it. I was confident that I'd find it for them as I've been very lucky to be able to track it down each time I've been in the park. Sean was convinced that he was jinx. I was beginning to believe him as we couldn't find it anywhere. Out of frustration, he sat down at the base of a huge Willow Oak on the Peninsula. Bob, Juliette and I walked around for a while then I went back to ask him if he had given up. He joked that the flycatcher was probably flying directly behind us and that's why we couldn't see it. He rationalized that if he stayed back he would see the flycatcher bringing up the rear. As he was talking something caught my eye at the edge of a patch of phragmites behind him. Wouldn't you know it, there was the flycatcher, directly on the other side of the tree from where Sean was sitting. You can't make these things up. If that wasn't satisfying enough a few minutes later a Nashville Warbler was spotted in the Willow Oak. By the end of the day we had counted three species of warbler, all of whom should be somewhere very far south of New York City by now. 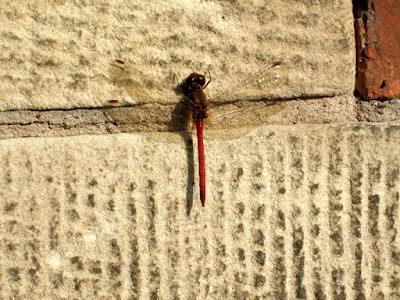 I guess we really haven't had many days of below freezing weather yet so there are still plenty of insects buzzing around. I'm actually still hearing crickets in the woods. On the way home we stumbled upon one of the resident Red-tailed Hawks hunting from a low perch at the edge of the baseball fields. He kept looking down into a pile of leaves at the base of the tree in which he was perched. We quietly watched but he eventually flew off towards the 15th Street entrance of the park without a meal. I spotted another one of the adult hawks perched low next to the Litchfield Villa at 5th Street. It was too dark at that point for a photograph.